Longleat’s infamous troop of mischievous monkeys have been wreaking havoc on unsuspecting motorists for decades. However even they were a little overwhelmed when they came face to face with the might of the British Army. Soldiers from the 1st Battalion The Yorkshire Regiment, which is based in Warminster, took one of their Warrior armoured vehicles through the monkey drive-through – much to the surprise of its simian inhabitants. The 27.5 tonne, six-metre-long caterpillar tracked vehicle was visiting the Wiltshire safari park ahead of a new military spectacular event which is taking place on the estate later this month. It wasn’t long before the monkeys’ innate curiosity, encouraged by a liberal sprinkling of tasty fruit and vegetables, overcame any lingering reservations and they were hopping on board to investigate the new arrival. After its trip through Monkey Drive-Thru, the Warrior entered Lion Country for some spectacularly close encounters with Longleat’s most famous residents. 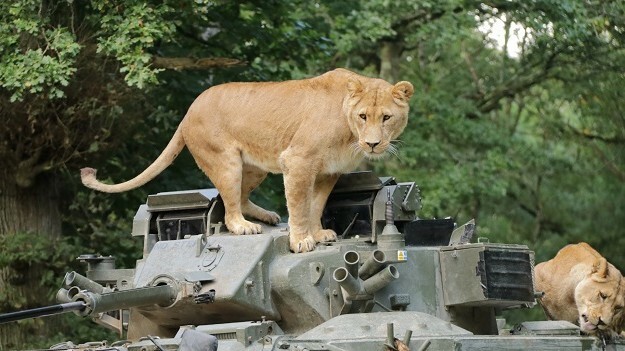 ”To be honest none of us were quite sure how the big cats would react when the Warrior arrived in the safari park,” said Event Partner Lieutenant Colonel Guy Benson. “The monkeys had initially kept their distance, but once they spotted the fruit, there was no stopping them. “The lions needed a lot less encouragement and a trio of them quickly climbed on to the vehicle to investigate. The crew were able to literally come face to face with the male as he stared into Warrior’s periscope,” he added. In spite of both the monkeys’ and the lions’ best efforts the Warrior, which has a three-man crew and can accommodate up to seven troops, emerged entirely unscathed from the encounters. It will be returning to Longleat, which signed the Military Covenant earlier this year, at the end of the month (30th September and 1st October) to take part in a new Military Spectacular event to celebrate the work of the Armed Forces. In addition to Warrior the event will feature several other armoured vehicles, including a Main Battle Tank, a helicopter and other specialist military equipment alongside live demonstrations, marching bands and parachute displays.